The big twinned sled is finally finished and I’m very happy with the final drawing. What I finally think of it will come in time, there’s that process of revisiting a picture and casting a fresh look over it to come over the next few days. For now though a couple of things spring to mind. What pleases me most is the tonal balance across the image, I’ve managed to avoid what I dread in some cases and that is that an overriding sense of greyness comes across. By not over shading certain areas of the drawing such as the upper bodywork I’ve managed to preserve enough contrast to keep a sense of depth. I find it very easy to keep laying on the ink, chasing some contrast only to end up with a picture that has very little real contrast left, just swathes of varying tones of grey. The other aspect that pleases me is the figure on the bike. He’s come out just right. I have to admit that it is a slow process learning how to make the wrinkles and folds in any clothing look convincing with plunging into too much detail. It’s getting there but there is still some way to go, and the end results that I’m looking for may very well come from applying less, not more detail. Overall not a bad effort and I’ll write some more thoughts about it as subsequent viewings stir the grey matter. Things are definitely moving forward though. 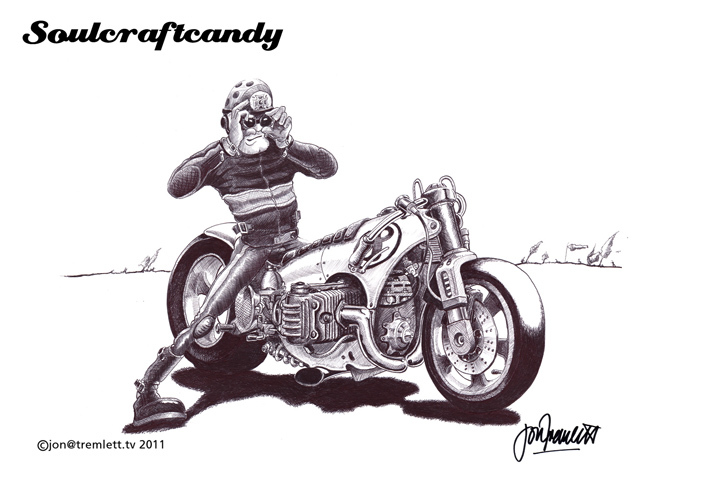 This entry was posted in Bike drawing, Biro drawing, Motorcycle drawings, Self-criticism, Shading by Soulcraftcandyman. Bookmark the permalink. They look great Jon…I’m sure they’ll go down amazingly well. It’s good to see your thoughts and consternations too.